Ontario Mills’ food court, once dubbed “Big Food,” has just gotten a lot smaller. Most of the food court’s tenants, including Kenny Rogers Roasters, La Salsa Fresh Mexican Grill, Everything Yogurt and Salad Cafe, Kelly’s Cajun Grill, Jody Maroni’s Sausage Kingdom and Cinnabon, had their last day of business today (December 31). Also closed is the Cheesecake Factory Bakery Cafe, located across from the food court. Bruegger’s Bagels, Burger King and Sbarro will remain open, but only until April. Outside the food court, Starbucks will also remain open until April. All the affected restaurants were franchises operated by HMS Host. The Ontario Spike’s Teriyaki Bowl, 843 N. Mountain Ave., has closed. I believe that was the last remaining location for the small chain. It appears that at various times, there were restaurants in Colton, Covina, El Monte and La Mirada. Participating Coffee Bean & Tea Leaf locations will be serving up 12-ounce hot and iced Caramel Lattes and Caramel Cream Tea Lattes for only $1 during its next open house event from 4 to 7 p.m. Wednesday (January 4). The offer is not valid in airport or Ralphs supermarket locations and cannot be combined with other offers. For more information, click here to visit the Facebook event page. For those of you who missed the Gingerbread Shop at this year’s Los Angeles County Fair (myself included), you can catch it at Riverside’s Festival of Lights. 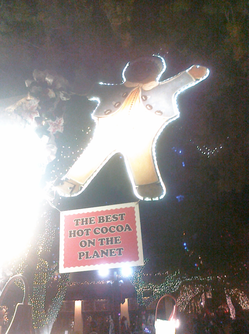 Gingerbread Shop will be selling cookies, gingerbread cake and “the best hot cocoa on the planet” through January 8. Prices appear to be unchanged since the 2010 L.A. County Fair. Some of you may be old enough to remember when the pink A-frame had a permanent spot in the Inland Center. Apparently, before that, they sold gingerbread at Santa’s Village. The current owners are from Yucaipa. The Gingerbread Shop is on the Main Street pedestrian mall, just north of Mission Inn Avenue. San Manuel Indian Bingo and Casino has mixed things up in its Serrano Buffet. 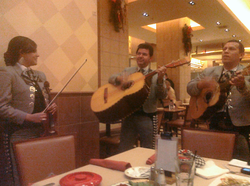 The Mexican buffet night has moved to Friday night, replacing the typical seafood buffet, which is now on Wednesday. Also, barbecue night has been moved to Tuesday. The big news is that they’ve also revamped the menu. Dine 909 was one of a select group of media folks invited to a special tasting dinner hosted by Chef Joe Craighead and Food and Beverage Manager Bob Svonkin a few weeks back. I enjoyed pretty much everything I sampled that evening. The changes are welcome, since while I’ve always thought that the Serrano Buffet was good, I’ve also thought that there was room for improvement. Head over the jump to read on! I can’t believe it’s been three years since the completion of the Loma Linda fresh & easy (at Redlands Boulevard and Mountain View Avenue), and it still isn’t open. But at least we’re not the only ones waiting. There are also two locations in Moreno Valley that were completed years ago and have yet to open. And a third there that opened for a while and then closed. You would think that a market that prides itself on having no high fructose corn syrup, added trans fats, artificial colors or flavors and preservatives only when necessary in its own line of foods would do well in a city where the proposal of allowing a McDonald’s within its borders caused wailing and gnashing of teeth. Click here to read business reporter Andrew Edwards’ update on the unopened market. The Handel’s Ice Cream empire is growing…and getting dangerously close to home! There’s a “coming soon” sign posted at 6403 Haven Ave. (just north of SR-210) in Rancho Cucamonga. The new location takes up two storefronts, so I’m thinking there might be room for indoor seating, as opposed to the Upland location, which is all outdoor seating. For those of you who have never experienced Handel’s, all you really need to know is that it’s a Dine 909 favorite. This will be the third California location for the Ohio-based Handel’s. There’s also a location in Redondo Beach. You know those other guys. They’ll give you a $5 bonus gift card when you purchase a $25 gift card. But remember to use that bonus gift card before it expires…at the end of January. Or even worse, they’ll make you spend $50 before you see any kind of bonus. Not Fleming’s Prime Steakhouse & Wine Bar. Oh, no. Reserve and dine at Fleming’s before December 30, spend $50 and they’ll knock $25 off your bill. And if you bring the whole crew and the bill comes to more than $150, you’ll also get a bonus $25 gift card to spend in the first three months in 2012. Spend over $300 and get a bonus $50 gift card. As if being able to give 40 free $10 gift certificates every day ’til Christmas through its Feed it Forward program wasn’t enough, restaurant.com is now offering many $25 gift certificates for only $1. As we’ve pointed out before, the certificates usually come with stipulations: Most likely, you have to spend $35 to be able to use the certificate, and an 18% gratuity is automatically added. The stipulations cut down your savings just a bit, but you’re still saving. The best part? It’s a great way to check out local restaurants (the majority of the restaurants on restaurant.com are mom and pops) without breaking the bank. You might find a new favorite. To begin, click here. Be sure to check the stipulations before you commit, and use the promo code “JOY” to get the 90% off discount. The folks over at KFC sent us a coupon to share with our readers. You can get two pieces (drumstick and thigh) and a biscuit for $2. The deal is good through Saturday (December 24) at participating Southern California locations. For more deals, head to KFC SoCal’s Facebook page.